Sir William Walworth (died 1385), was twice Lord Mayor of London (1374–75 and 1380–81). He is best known for killing Wat Tyler. He is said to have suppressed usury in the city during his term of office as mayor. His name frequently figures as advancing loans to Richard II. He supported the king's uncle John of Gaunt, 1st Duke of Lancaster in the city, where there was a strong opposition to John. William Walworth worked for a time in the Customs House under Geoffrey Chaucer. In John Gardner's book "The Life and Times of Chaucer" Walworth is described as one of a number of important merchants, all friends of Alice Perrers, who used their influence with the king (Edward III). In his book Gardner says that according to complaints in the House of Commons, this group conspired to keep food prices up, lent money to the king at inflated interest, and through personal and financial influence persuaded the king to issue edicts profitable to themselves. 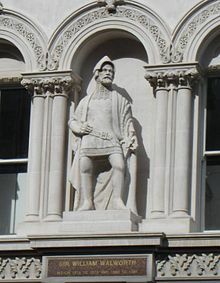 His most famous exploit was his encounter with Wat Tyler during the English peasants' revolt of 1381, in his second term of office as Lord Mayor. In June of that year, when Tyler and his followers entered south London, Walworth defended London Bridge against them. 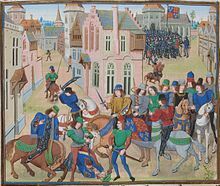 He was with Richard II when he met the insurgents at Smithfield, and killed the rebel leader with his baselard. The circumstances of the killing – including whether Walworth planned the attack or struck on the spur of the moment – have always been unclear. Walworth raised the city bodyguard in the king's defence, for which service he was rewarded by knighthood and a pension. He subsequently served on two commissions to restore the peace in the county of Kent. He died in 1385, and was buried in the church of St. Michael, Crooked Lane, of which he was a considerable benefactor. Sir William Walworth was the most distinguished member of the Fishmongers Guild, and he invariably figured in the pageants prepared by them when one of their members attained the mayoralty. He became a favorite hero in popular tales, and appeared in Richard Johnson's Nine Worthies of London in 1592. William Walworth is commemorated with a statue on Holborn Viaduct, near the boundary of the City of London. ^ "Chronological list of aldermen: 1302-1400". British History Online. Retrieved 6 October 2016. ^ The Life and Times of Chaucer, Barns & Noble Inc., 1977. This article incorporates text from a publication now in the public domain: Chisholm, Hugh, ed. (1911). "Walworth, Sir William" . Encyclopædia Britannica. 28 (11th ed.). Cambridge University Press.